King Arthur was ambushed and imprisoned by the monarch of a neighboring kingdom. The monarch could have killed him, but was moved by Arthur's youth and ideals. So the monarch offered him freedom, as long as he could answer a very difficult question. Arthur would have a year to figure out the answer and if, after a year, he still had no answer, he would be put to death. better than death, he accepted the monarch's proposition to have an answer by year's end. He returned to his kingdom and began to poll everybody: the princess,>the prostitutes, the priests, the wise men, and the court jester. He spoke with everyone, but no one could give him a satisfactory answer. Many people advised him to consult the old witch -- only she would know the answer. The price would be high; the witch was famous throughout the kingdom for the exorbitant prices she charged. and Arthur's closest friend.Young Arthur was horrified: she was hunchbacked and hideous, had only one tooth, smelled like sewage, made obscene noises... etc. He had never encountered such a repugnant creature.He refused to force his friend to marry her and have to endure such a burden. 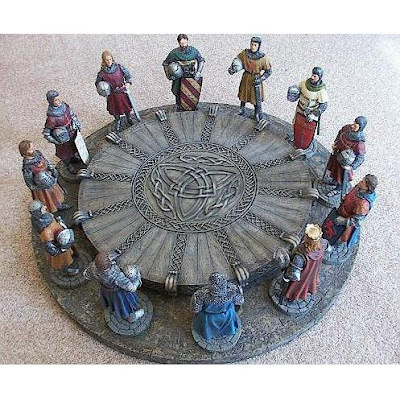 and the preservation of the Round Table.Hence, their wedding was proclaimed, and the witch answered Arthur thus: What a woman really wants is to be in charge of her own life. monarch granted Arthur total freedom. relief and anguish. Gawain was proper as always, gentle and courteous. The hour approached, Gawain, steeling himself for a horrific experience, entered the bedroom. But what a sight awaited him! The most beautiful woman he had ever seen lay before him. the other half, she would be her beautiful maiden self. Which would he want her to be during the day, and during the night? the privacy of his home, an old witch? Or would he prefer having by day a hideous witch, but by night a beautiful woman with whom to enjoy many intimate moments? MORAL: IF A WOMAN DOESN'T GET HER WAY, THINGS GET UGLY. Thanks Shruti for narrating this nice fable in a nice way.